Applicants to the STUDIO’s Frank-Ratchye Fund for Art @ the Frontier (FRFAF) are asked to submit a budget for their proposal. 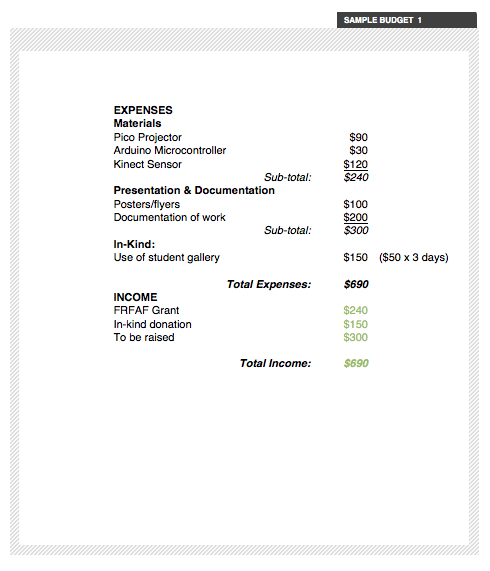 An Excel spreadsheet is the preferred format for this budget; however, plain text documents may be adequate for e.g. small projects and FRFAF Microgrant proposals. Your project budget helps the selection committee understand how grant funds will be spent. The budget also shows the applicant’s ability to plan and manage a project. It is a flexible document for you to use and revise as you plan and carry out your project. Some points to consider are below. 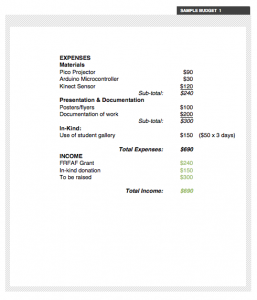 A complete budget includes expenses AND income. Please include all possible income and designate as confirmed, projected or pending. An in-kind item is a donated good or service for which you would otherwise have to pay. You should indicate the source of all in-kind items as well as the dollar amount. 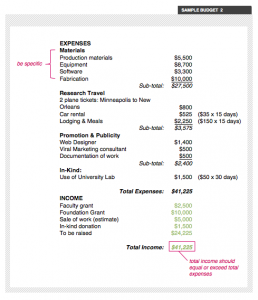 The source should be listed in the income section. 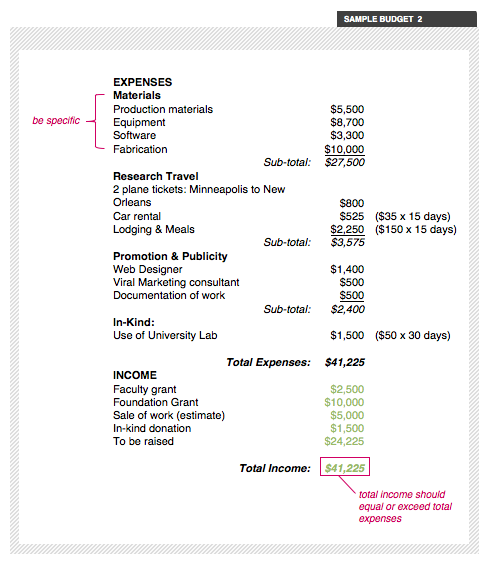 In-kind goes in as income and comes out as an expense of the same amount. This dollar amount should represent the fair-market value of the in-kind good or service. If you’re not yet sure of the fair-market value of your in-kind line items, simply write “value to be determined,” and add the dollar amount when you know it.